When creating a website in free website builder with no coding WebWave, you can easily make your own URL addresses to subpages and articles on your website. In this article you will learn how to create URLs in WebWave webdesign software. 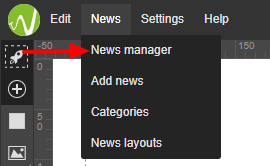 Enter website builder and go to News-> News manager. In the next step, unroll settings of a chosen newspage and change page address. In the last step select a main newspage address - the one that will be displayed in a browser when user enters the newspage.